I am not an audiophile. I have no ear for quality sound. But, I know bad sound and my rear speakers (the ones in the deck storage compartment) just didn't sound good. I searched this forum and found where to buy new brackets to upgrade the speakers to 3 1/2 inches. The install was plug and play. Very nice improvement for $126. And, I sold my old OEM brackets on eBay and cleared $30, so I guess it was only $96! I have the rear speakers as well and I have to turn my fader all the way to 8-9 to actually hear them and they do sound crappy. They are 6 ohm speakers. I see the Pioneers you purchased are 4 ohm so that is probably why you are getting better sound; less load on the amp as these are wired in series. I may have to put this on my project list. Thanks for sharing!! Also. Looking at my rear deck it looks like those larger speakers won't fit. Did you have any figment issues or do you have a different deck without the storage compartment? No, I have the OEM rear deck that came with the speakers. With the brackets from euromotorspeed they fit perfect. And, the brackets are metal where the factory ones were plastic. I have a complete high end Audison speaker system in the front factory locations with their sound processor and Alpine 150w channel amp. It sounds amazing. I don't even have my rear speakers hooked up! I haven't seen any bands with instruments playing from behind anyway. My stereo appreciation goes way back to when rear speaker gave us most of the sound. But not anymore as I have learned from high end audio that a top quality front Sound Stage is all that's necessary. That makes sense. But, for my flat, dead & old ears I am good with this. Last edited by Chuck W.; 04-07-2017 at 09:57 PM. I did this project a few years back. 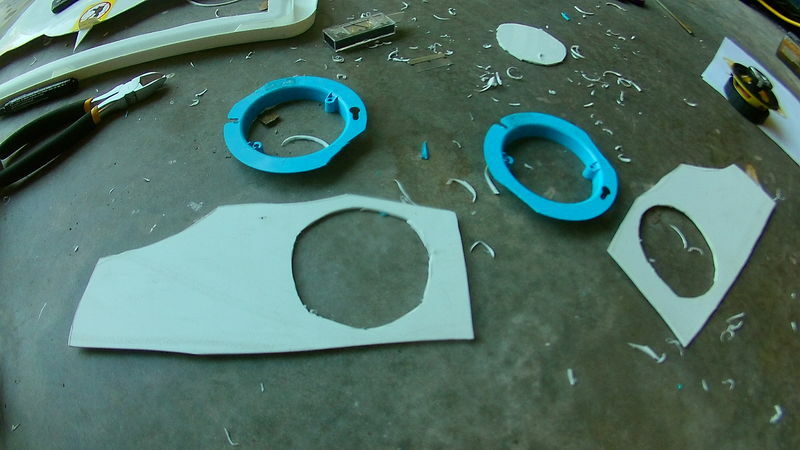 You can enlarge the factory bracket with a dremel but it is not the easiest to fit. I did it but I was not happy with the result even though no one can see it. Later, I found the metal brackets Chuck linked to and ordered them. 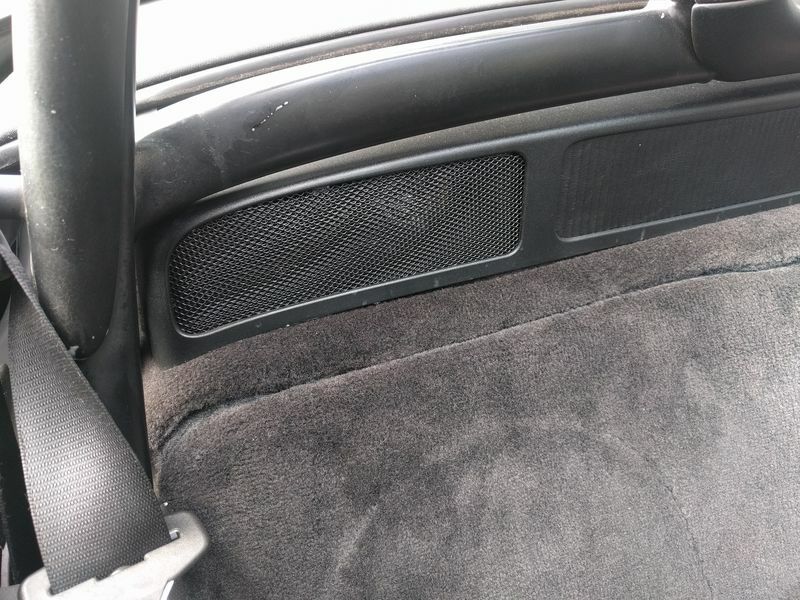 They fit the speakers and rear deck perfectly, highly recommended! Hi Chuck! I have a 99. Added 6 speakers to my rear deck. Made my brackets out of wood according to DIY elsewhere and added 4 3.5 speakers. I had a pair of 4x6's sitting around so added those also to the center of the storage box. At 100 with the top down clear as can be! hey - bump to this thread. looking to do the same thing. intent would be to get the rear storage shelf, get the 3.5" speaker kit, but add additional speakers to the centre. would want the whole unit to stand alone - that is, no other speakers in the car except for what is installed in the rear shelf (want to use a blutooth amp so that i can pair my phone to the unit when i want music for cruising, and pull the whole thing out when at the track). so, what would be best for the middle speakers - 3 or 3.5" subwoofers, more 3.5" pioneers, a 4x6 setup or ... ? thanks for any help; this stufff is greek to me. Anyone ever put a micro amp in center of rear console to drive the rear speakers? Would just need a 12v accessory power. A 100w amp should drive the two 3.5's pretty well. Have not done this but if you put a 100 watt amp there you would need a larger power line from the battery and a remote power wire. Easier to run speaker wires from the frunk to the rear speaker shelf. Other option without knowing your setup use a 6 channel amp from a 996 cadriolet. Or go full after market set up. FYI, If you are going to make your own rear speaker mounts, I have found a very cheap part at Home Depot that will make your life easier to mount the speakers. After cutting the holes by hand on my mounts, these worked great, and were only about $1.50 each. After mounting, scuff with scotch pad, then paint. 3.5" speakers fit PERFECTLY, and great to attach, no rattles! Disclaimer: I am by any means not an audiophile, so please no comments on my choice of "cheapy-deapy" speakers. They were super-ultra cheap on Amazon, and if and when they blow, I'll upgrade for something else. I had to justify possibly cannibalizing them before even knowing what my end result would be. All in all, I am pretty happy, it "fills" the back sound enough (I have them directly connected to HU, since I only have 4 channel amp). Definitely adequate, no complaints. For speaker connection, I did one run of 16g 2 pair cable thru the center console, and used a MOLEX plug so I could "quick disconnect" the rear enclosure when I needed to access the engine. Looks good, didvyou make atemplate by chance? And whatis the actual productyou used? It might be useful info for prosperity. Lol. Ii wish i had a home depot here. I used template provided on this thread as my starting point. Many different materials have been used by different users, since I was verifying it worked first, I actually used the top off an old sterilite storage bin. Traced it out, used a box cutter new fresh razor blade (only cut myself once!).. cut outside the lines first, then trimmed-fitted as needed. Scuffed up with scrub pad, and sprayed black. For the covers, I used (much like many others) an IKEA trash bin. Thankfully I have an angle grinder, which made cutting a trimming much-much faster than having to do it with tin snips or wire cutters! Scuffed and trimmed, painted black, clear coated, hot glued in. Still pretty visible inside, so I put some black screen material behind it. Came out pretty nice! I'll post some pics tonight if I have a chance. Cool. I have a PnP kit but I am not going to install it, I did new 3 way components 6.5" 3", 1.5" and a pioneer PRS 80 HU. I set it to network mode Tweeters are power off HU Hi out, have the RCA mid running to the factory amp, as is sounds excellent. 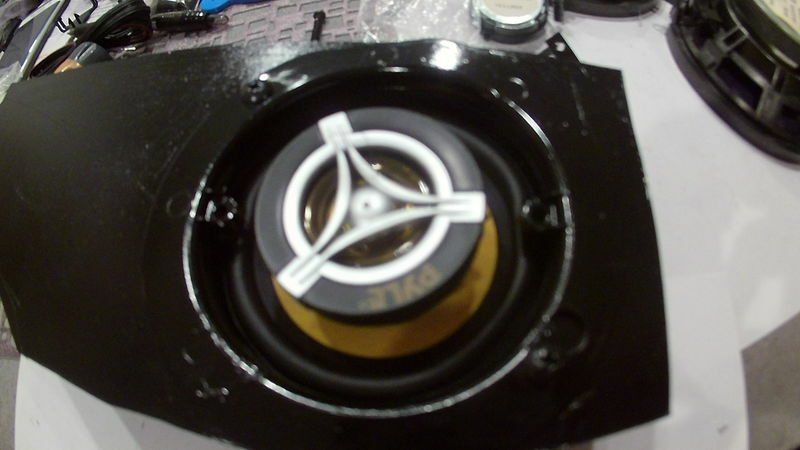 Have an Alpine amp and a 8" floor sub going in to finish. Here's a pic of completed rear speakers in enclosure. Turned out really nice! Excellent job.